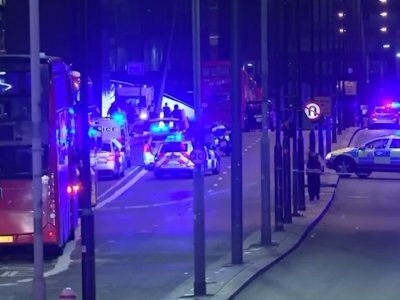 LONDON (AP) — British police arrested a dozen people Sunday in a widening terrorism investigation after attackers using a van and large knives turned a balmy evening of nightlife into a bloodbath and killed seven people in the heart of London. The Islamic State group claimed responsibility. Although the attackers were also dead, authorities raced to determine whether they had accomplices, and Prime Minister Theresa May warned that the country faced a new threat from copycat attacks. “There was a car with a loudspeaker saying ‘go, go’ and they (police) threw a grenade. ... and then I ran,” he said. Islamic State’s statement from its Aamaq news agency claimed the group’s “fighters” were responsible, the SITE Intelligence Group said Sunday. IS has urged supporters to weaponize vehicles in attacks against the West. It was the third attack in Britain this year that Islamic State has claimed — including the similar attack on Westminister Bridge in March and the Manchester concert bombing two weeks ago — and one of several involving vehicles in Europe, including last year’s Bastille Day rampage in the French city of Nice. The three attackers Saturday were wearing what appeared to be suicide belts, but the belts turned out to be fake. Investigators were working to determine whether others assisted them, Rowley said. Forty-eight people, including two police officers, were treated at hospitals. Twenty-one remained in critical condition Sunday. Among the wounded were German, French, Spanish and Australian citizens, officials said. Canadian Prime Minister Justin Trudeau said a Canadian woman was among the dead, and a French national was also confirmed dead. On May 22, a suicide bomber killed 22 people and injured dozens at an Ariana Grande concert in Manchester, in northwest England. Grande and other stars performed Sunday night at a benefit concert for victims under tight security in Manchester. “I don’t feel or smell or hear or see any fear in this building. All we feel here tonight is love, resilience, positivity,” said Pharrel Williams, who performed alongside Miley Cyrus. 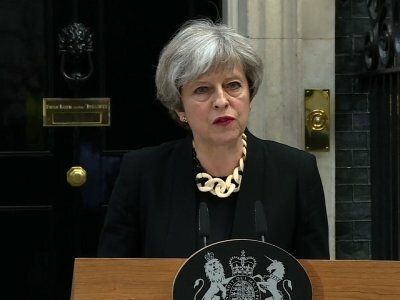 May said the London and Manchester attacks were not directly connected, “but we believe we are experiencing a new trend in the threat we face” as “terrorism breeds terrorism” and attackers copy one another. She said five credible plots have been disrupted since March. “I went ‘Oi, terrorists, cowards, Oi!’” he told The Associated Press. Then he picked up a chair. Associated Press writers Lori Hinnant, Sylvia Hui, Raphael Satter, David Keyton and Niko Price in London and Alison Mutler in Bucharest contributed to this report.